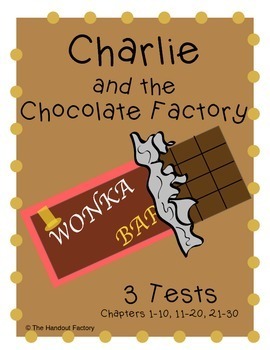 This packet includes 3 tests for the book, Charlie and the Chocolate Factory. Each test has an answer key. These tests go beyond just basic recall. 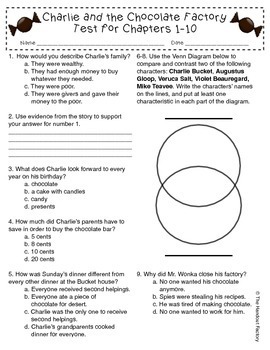 There are a few basic recall questions, but most questions deal with the following reading skills: cause and effect, sequencing, using text as evidence, compare and contrast, genre, mood, characterization, opinion, and more. The tests are divided in the following way: Test 1 covers chapters 1-10 (17 questions). Test 2 covers chapters 11-20 (14 questions). Test 3 covers chapters 21-30 (15 questions).